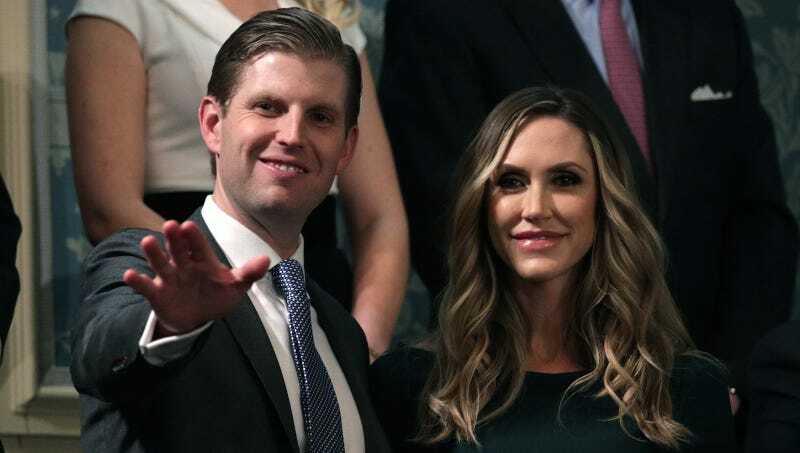 In a glowing profile titled “First, Family,” Westchester Magazine interviewed Eric and Lara Trump about “their cherished life in Westchester,” tactfully skipping over questions about, say, Eric’s father’s policy of forcibly separating immigrant children from their parents at the border in favor of listing the couple’s favorite grocery stores. Revelations abound. Below are some crucial takeaways from Westchester Magazine’s reporting. Despite what you may think based on what you have seen in photographs, Eric Trump is not unattractive. Not only handsomer in person than in pictures, Eric is tall, even taller than his father. Tiffany Trump, 24, should not be considered an adult. Family matters to Eric Trump. When Eric says, “Family is what matters to me,” one can easily detect the sincerity. Eric Trump is good with dogs, and therefore, children. Westchester, a wealthy county in New York, had a big influence on Eric Trump. Lara Trump fell off a horse and broke both wrists before her wedding and then pretended she didn’t. Lara Trump is kind of intense! Last year, she completed that race while pregnant, a fact that prompts Eric to affectionately point out that “she is nutty,” adding that, technically, he’s the only one of his three-member family who hasn’t completed a triathlon. Again, Westchester is really more of a state of mind. Congratulations to the people of Westchester.